This category contains Mid-Western and New England tableware, flasks, chestnuts, wine glasses, blown and pitchers, as well as blown 3-mold glass. GI-41 “Washington-Taylor” 1/2 pint Historical flask in aquamarine. Smooth base. Nice small flask from an old New England collection (old label affixed). Minor roughness on small area of lip. May have come from the making. 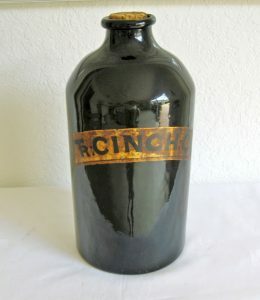 Large early 19th C. dark olive amber green apothecary bottle with its old, if not original, fitted cork, 13″ tall with its original gold painted label “T R. CINCH C”. 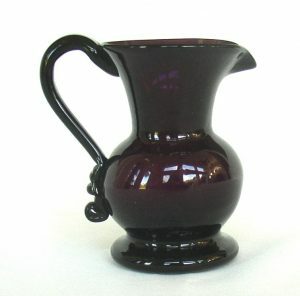 It has a smooth base showing good wear, body is 6 1/2″ diameter. Overall condition is excellent with only a small open bubble (1/4″) on the shoulder and some age discoloration on the gold label. 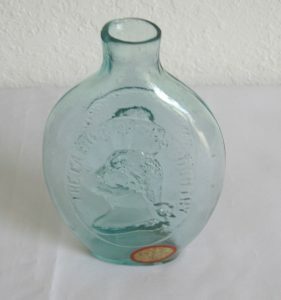 The bottle was blown in a shoulder high dip mold with hand formed shoulders, neck and rolled lip. 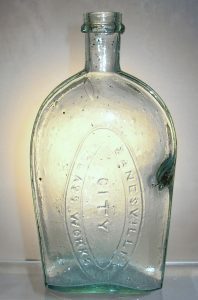 Very scarce embossed “Zanesville City Glass Works” flask in a medium yellow aquamarine color. Bubbles and large slag inclusion (visible in photo) with no radiations. Very minor flake on outer lip edge. 7 1/2″ tall. 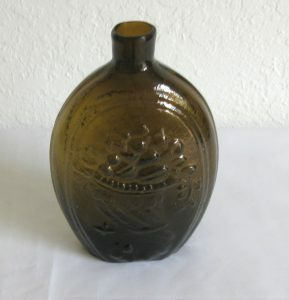 Very nice example of a pint GII-73 “Eagle Cornucopia” Flask in deep olive amber, Keene, NH Glass Works. Excellent mold impression and virtually mint condition. Glass is clear and brilliant with no damage, no stains or haze. This example appears to be a bit “fatter” than usual giving it a nice hefty look. No noticeable surface wear. 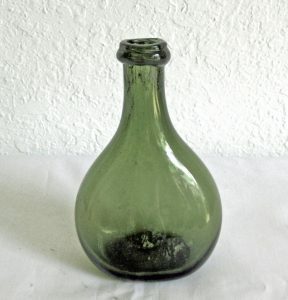 Late 18th, early 19th C. blown chestnut shaped bottle with applied ribbon lip. Nice medium olive green color. Excellent condition. 5 7/8″ tall. Likely European origin. 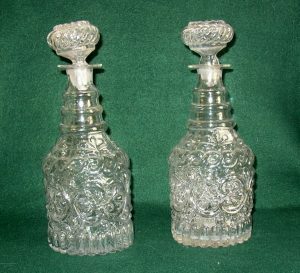 Beautiful pair of quart size blown 3-mold clear glass decanters in the GV-14 pattern. Nice crisp pattern impressions with clear brilliant glass. Original stoppers. Excellent condition with no damage or staining. Size is 11″ tall. Ex Paul Richards collection. A very good natural pair.